Whether you call them trucks, big rigs, semis, 18-wheelers, or the actually correct "tractor-trailers," these behemoths of the road are among the most under-appreciated vehicles in existence. 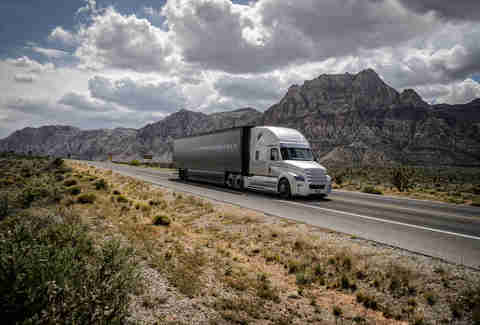 Unless you're entirely self-sufficient (and if you're reading this, you're not), you depend on tractor-trailers for a whole lot more than you probably realize -- which is why advances in trucking technology will impact you far more than any fancy high-tech developments coming to your car. Best part is, you don't have to do a single thing to reap the benefits, ranging from safer roads to more money in your pocket. 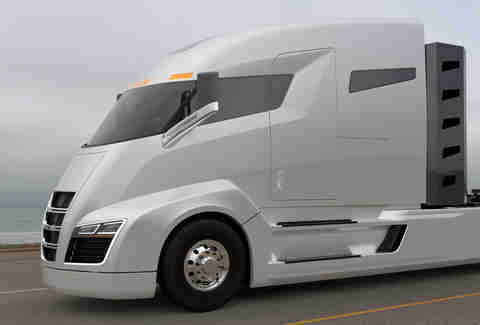 A handful of players are in the race to roll out electric and autonomous trucks -- Elon Musk, for example, recently announced Tesla’s plans to develop electric tractor-trailers that can drive themselves. Typical of Musk, his timeline was a bit vague, but let’s take a look at some of the cool-as-hell truck concepts that are already hitting highways. 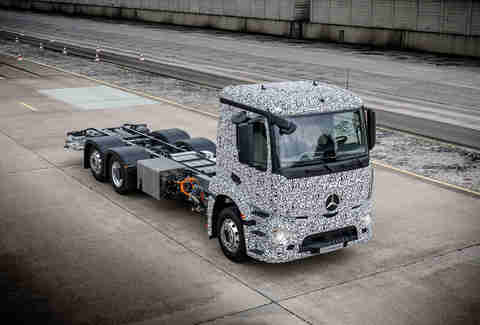 When you'll see one: As you can see from the camouflaged prototype shown here, it's already being tested on the road. 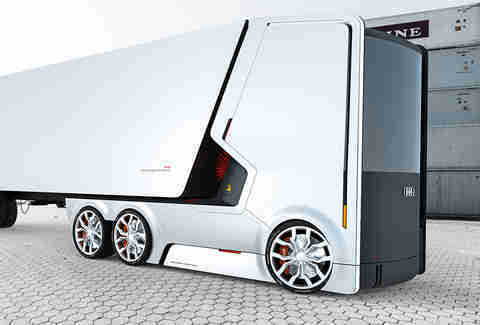 This is as clear a window into the future of trucking as there is.The Urban eTruck is an electric tractor capable of towing a trailer loaded with 26 tons of goods. It's not a long haul truck -- with a range of just over 120 miles, it's designed purely as an urban cargo carrier. The fuel and emissions savings are self-evident, but the reduction of noise is potentially the most underrated aspect of this truck; close your eyes and imagine your city without any truck sounds and you'll get the idea. As Mercedes points out, this is a pre-emptive move against potential bans of internal combustion engines in heavily congested city centers -- which is distinctly possible in several European cities. Mercedes is testing the tech in a smaller truck first, and that one is already in the hands of customers on a trial basis. Look for this one to start making an impact by the end of the decade. When you'll see one: The company's already taking deposits ahead of its official reveal in December 2016. The Nikola One is driven by electric motors, but it's actually a hybrid that's more like a BMW i3 than a Tesla. The batteries are charged by a CNG-powered turbine, which means it can travel up to 1,200 miles without stopping, all while spitting out zero emissions. Unlike a plug-in EV that requires a lengthy charge, the Nikola is good to go after a quick CNG fill-up. If the finished product delivers anywhere close to its promises on economy and emissions, it's pretty revolutionary. Big rigs are among the largest polluters on the road, so the more Nikola tractors out there, the better it is for air quality. Also hugely important: the economics of running a vehicle like this. With greatly reduced running costs, manufacturers will be able to get their raw materials more cheaply, and retailers will spend less money getting the finished goods to the store. While some of those savings will no doubt be swallowed up in the name of corporate profit, some will wind up in your pocket by way of cheaper goods. You won't have to do a thing to reap the benefits of this truck and others like it. When you'll see one: It's currently testing on public roads in Nevada. The Freightliner features a semi-autonomous mode much more advanced than current Teslas, with an array of sensors and a dual-lens camera to monitor surrounding traffic and keep an eye out for obstacles -- all while identifying and observing posted road signs. At a basic level, this means that the next generation of long-haulers will be right up there with today's most advanced luxury cars in terms of semi-autonomous control. Dig a little deeper, though, and this has the potential to reduce fatigue amongst truckers -- something that's a highly contentious issue today. When you'll see one: The technologies in the FT 2025 will definitely make their way onto public roads, but this truck is just a testbed-slash-showcase. The FT 2025 takes the autonomous system from the Freightliner above and builds on it. The interior is much more comfort-oriented, reflecting that there's even less of a need for a trucker's full attention. The vehicle itself is equipped with additional communication systems, in anticipation of the need to "talk" to other vehicles on the road about everything from conditions to lane changes. It's a fairly clear view of the direction in which trucks are headed, and it's representative of Mercedes' vision for the mid-term future of trucking. 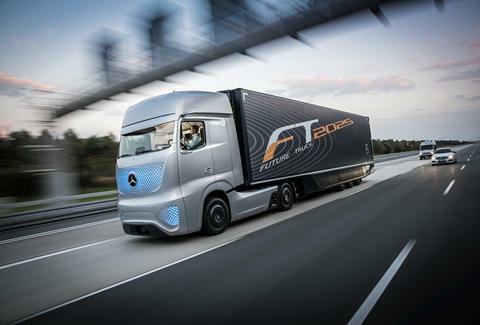 When you'll see one: It's already been proven in trials, and will be a reality as soon as there are enough autonomous tractor trailers on the road. This is an advanced method of organizing traffic wherein a lead vehicle is followed at extremely close range by a bunch of other vehicles. The concept is that by tailgating so closely, the following vehicles all save plenty in terms of fuel efficiency. The European Union funded quite a bit of research in this along with Volvo a few years back. Aside from the obvious corporate fuel savings, this has the potential to clear up a lot of interstate traffic. When autonomous trucks stick close together in the right lane, you won't have to worry about getting stuck behind one truck passing another up a hill. When you'll see one: You won't, sadly. The Truck for Audi is a design-study collaboration between two guys who set out to design an ideal truck of the future -- to be built by Audi. The fundamental principles here are fantastic aerodynamics and fully autonomous driving. While it might not represent an actual vehicle in the pipeline, it does shed some interesting light on the shape of trucks in the future. While a sleek, wind-cutting shape is the gold standard today, that won't always be the case, as this concept shows. When autonomous road trains come to pass (see above), this brick-like shape will actually start to make sense as a means of minimizing the required space between vehicles. Aaron Miller is the Cars editor for Thrillist, and can be found on Twitter and Facebook. While he doesn't want an autonomous vehicle for himself, he welcomes the self-driving truck evolution.